The Aztec Empire was the last of the great Mesoamerican cultures. Between A.D. 1345 and 1521, the Aztecs forged an empire over much of the central Mexican highlands. At its height, the Aztecs ruled over 80,000 square miles throughout central Mexico, from the Gulf Coast to the Pacific Ocean, and south to what is now Guatemala. Millions of people in 38 provinces paid tribute to the Aztec ruler, Montezuma II, prior to the Spanish Conquest in 1521. Scroll down to see articles about the government, religion, military, and agricultural system of the Aztec Empire. The Aztecs didn’t start out as a powerful people. The Nahuatl speaking peoples began as poor hunter-gatherers in northern Mexico, in a place known to them as Aztlan. Sometime around A.D. 1111, they left Aztlan, told by their war god Huitzilopochtli that they would have to find a new home. The god would send them a sign when they reached their new homeland. Scholars believe the Aztecs wandered for generations, heading ever southward. Backward and poor, other more settled people didn’t want the Aztecs to settle near them and drove them on. Finally, around A.D. 1325, they saw the god’s sign—the eagle perched on a cactus eating a serpent on an island in Lake Texcoco, or so the legend has it. The city established by the Aztecs, Tenochtitlan, grew to become the capital of their empire. Fortunately, the site was a strong, strategic area with good sources of food and clean water. The Aztecs began to build the canals and dikes necessary for their form of agriculture and to control water levels. They build causeways linking the island to the shore. Because of the island location, commerce with other cities around the lakes was easily be carried out via canoes and boats. Through marriage alliances with ruling families in other city states, the Aztecs began to build their political base. They became fierce warriors and skillful diplomats. Throughout the late 1300s and early 1400s, the Aztecs began to grow in political power. In 1428, the Aztec ruler Itzcoatl formed alliances with the nearby cities of Tlacopan and Texcoco, creating the Triple Alliance that ruled until the coming of the Spanish in 1519. The last half of the 15th century saw the Aztec Triple Alliance dominating the surrounding areas, reaping a rich bounty in tribute. Eventually, the Aztecs controlled much of central and southern Mexico. Thirty-eight provinces sent tribute regularly in the form of rich textiles, warrior costumes, cacao beans, maize, cotton, honey, salt and slaves for human sacrifice. Gems, gold and jewelry came to Tenochtitlan as tribute for the emperor. Wars for tribute and captives became a way of life as the empire grew in power and strength. While the Aztecs successfully conquered many, some city states resisted. Tlaxcalla, Cholula and Huexotzinco all refused Aztec dominance and were never fully conquered. The Aztec Empire was powerful, wealthy and rich in culture, architecture and the arts. The Spanish entered the scene in 1519 when Hernan Cortes landed an exploratory vessel on the coast. Cortes was first welcomed by Montezuma II, but Cortes soon took the emperor and his advisors hostage. Though the Aztecs managed to throw the conquistadors out of Tenochtitlan, the Spanish regrouped and made alliances with the Aztec’s greatest enemy, the Tlaxcalans. They returned in 1521 and conquered Tenochtitlan, razing the city to the ground and destroying the Aztec empire in the process. The Aztec Empire had a hierarchical government with power and responsibility running from the top down. The empire’s rule was indirect over its provinces. That is, as long as the province or territory paid the tribute it owed the empire in full and on time, the empire left the local leaders alone. The foundation of the empire’s hierarchical structure was the family. A group of interrelated families then formed a calpulli, a sort of neighborhood or guild. The calpullis organized local schools and shrines and took care of the group as a whole. Each calpulli elected a headman to oversee the calpulli’s responsibilities. Most Aztec cities contained many calpulli. The headman of each calpulli was a member of the city council. The city councils had a good deal of power; they made sure the city ran smoothly. Each council had an executive council of four members. These four members were nobles and usually a member of a military society. One of the four executive council members would be elected the leader of the city, the tlatcani, who oversaw not only the city but the surrounding countryside as well. These city councils and leaders formed the provincial network of the empire. At the center of the empire were the main Aztec altepetls, or city states, of Texcoco, Tlacopan and Tenochtitlan. Of the three, Tenochtitlan gradually muscled its way to dominate over the others. The pinnacle of power centered in the Huey Tlatoani, the Reverend Speaker or emperor. The emperor had absolute power and was worshipped as a god. By the emperor’s side was his Snake Woman or Cihuacoatl, who functioned as a grand vizier or prime minister. Although Snake Woman was the title of this position, it was always held by a man, usually the emperor’s brother or cousin. While the Huey Tlatoani dealt with issues of diplomacy, tribute, war and expansion of the empire, the Snake Woman’s responsibility was Tenochtitlan itself. Directly under the emperor were his advisors, the Council of Four. These advisors were generals from the military societies. If something were to happen to the emperor, one of these four men would be the next Huey Tlatoani. The council advised the emperor in his decisions. The empire required a host of other government offices, which were filled by a city’s noble families. Each city had a court system with Special Courts, Appellate Courts and a Supreme Court. The city’s merchant class, the pochteca, had their own court to consider matters of trade. Managing the constant incoming tribute goods from far-flung provinces required another power structure, both central and provincial. Government officials also oversaw the markets, from the central markets of the cities to the smaller markets of town and country. All of the priesthood and government officials reported to the emperor and his Council of Four. All supported the emperor. Although the Aztec Empire’s grip on its provinces was light, the tribute flowed into the central coffers. The Aztec warrior was highly honored in society if he was successful. Success depended on bravery in battle, tactical skill, heroic deeds and most of all, in capturing enemy warriors. 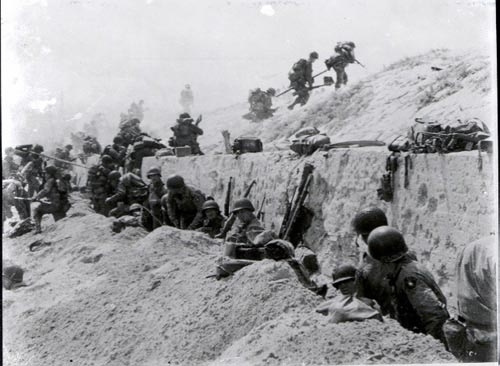 Since every boy and man received military training, all were called for battle when war was in the offing. Both commoners and nobles who captured enemy warriors moved up in military rank or became members of military orders. Many nobles joined the army professionally and functioned as the command core of the army. While the Aztec economy depended on trade, tribute and agriculture, the real business of the empire was war. Through war, the Aztec Empire gained tribute from conquered enemies. People captured during war became slaves or sacrifices in the Aztec’s religious ceremonies. Expanding the empire through further conquests strengthened the empire and brought more riches in tribute. For this reason, the emperor rewarded successful warriors of both classes with honors, the right to wear certain garments in distinctive colors, nobility for the commoners and higher status for nobles and land. Every Aztec warrior could, if he captured enemy warriors, advance far in society. Rank in the military required bravery and skill on the battlefield and capture of enemy soldiers. With each rank, came special clothing and weapons from the emperor, which conveyed high honor. Warrior clothing, costumes and weaponry was instantly recognizable in Aztec society. Tlamani: One captive warriors. Received an undecorated obsidian-edged club and shield, two distinctive capes and a bright red loincloth. Cuextecatl: Two captive warriors. This rank enabled the warrior to wear the distinguishing black and red suit called a tlahuiztli, sandals and a conical hat. Papalotl: Three captive warriors. Papalotl (butterfly) were awarded with a butterfly banner to wear on his back, conferring special honor. Cuauhocelotl: Four or more captive warriors. These Aztec warriors reached the high rank of Eagle and Jaguar knights. Eagle and Jaguar warriors were the two main military societies, the highest rank open to commoners. In battle they carried atlatls, bows, spears and daggers. They received special battle costumes, representing eagles and jaguars with feathers and jaguar pelts. They became full-time warriors and commanders in the army. Great physical strength, battlefield bravery and captured enemy soldiers were necessary to obtain this rank. Commoners who reached the vaunted Eagle or Jaguar rank were awarded the rank of noble along with certain privileges: they were given land, could drink alcohol (pulque), wear expensive jewelry denied to commoners, were asked to dine at the palace and could keep concubines. They also wore their hair tied with a red cord with green and blue feathers. Eagle and jaguar knights traveled with the pochteca, protecting them, and guarded their city. While these two ranks were equal, the Eagle knights worshipped Huitzilopochtli, the war god and the Jaguars worshipped Tezcatlipocha. The two highest military societies were the Otomies and the Shorn Ones. Otomies took their name from fierce tribe of fighters. The Shorn Ones was the most prestigious rank. They shaved their heads except for a long braid of hair on the left side and wore yellow tlahuiztli. These two ranks were the shock troops of the empire, the special forces of the Aztec army, and were open only to the nobility. These warriors were greatly feared and went first into battle. While many other Aztec art works were destroyed, either by the Spanish or by the degradations of time, Aztec stone carvings remain to give us a glimpse into the worldview of this supreme Mesoamerican culture. These masterpieces were discovered in Mexico City in the buried ruins of the former Aztec capital of Tenochtitlan and its grand pyramid, Templo Mayor. Coatlicue was the Aztec’s earth mother goddess, although a fearsome one. Goddess of the earth, childbirth, fertility and agriculture, she represented the feminine power of both creation and destruction. A massive stone statue of Coatlicue was discovered in Mexico City in 1790. Almost 12 feet tall and 5 feet broad, the statue shows the goddess as much a goddess of death as of birth. With two facing serpents as her head, claws on her hands and feet, a skirt of serpents and a necklace of skulls, hands and hearts, she reveals the Aztec’s terrifying view of their gods. The myth of Coatlicue tells of the birth of Huitzilopochtli, the Aztec god of war and the sun. The myth of Coatlicue tells of a priestess sweeping the sacred temple on Mount Coatepec when she was impregnated by a ball of feathers. Her son Huitzilopochtli is born full grown when Coatlicue is attacked by her daughter, the moon goddess. The newborn warrior kills his sister and cuts her into pieces, symbolizing the victory of the sun over the moon. The statue was so horrifying that each time it was dug up, it was reburied. 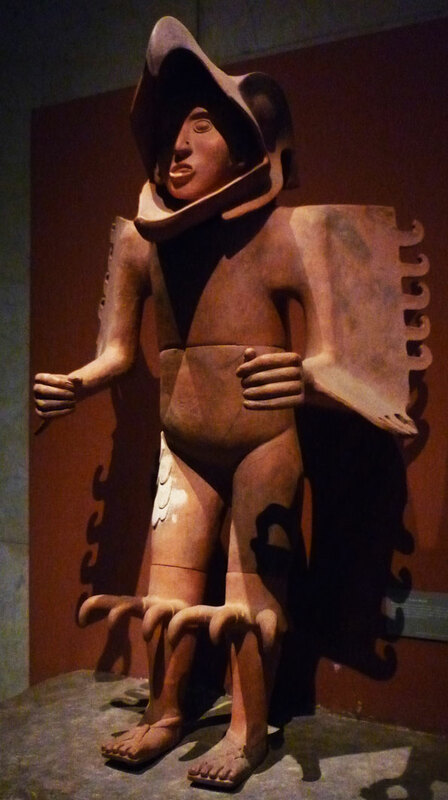 The statue now resides at the National Museum of Anthropology in Mexico City. The Stone of Tizoc is a carved disk showing the victory of the emperor Tizoc over the Matlatzinca tribe. The emperor had it carved to celebrate his victory and reveal the martial power of the Aztecs. The large, circular disk has an eight-pointed sun carved on the top, which was used for sacrificial battles. A warrior captured in battle was tied to the stone, and armed with a feather lined club. Aztec warriors, armed with obsidian lined clubs, fought the tied warrior and naturally defeated him. The side of the eight-foot diameter disk depicts Tizoc’s victory. The Matlatzincas are shown as despised barbarians, while Tizoc and his warriors are represented as noble Toltec warriors. The Stone of Tizoc artfully mixes sun worship, mythology and Aztec power. Today this masterful carved stone is at the National Museum of Anthropology in Mexico City. Another massive stone disk, the carvings on the Sun Stone, also known as the Calendar Stone, show the four consecutive worlds of the Aztecs, each one created by the gods only to end in destruction. This basalt stone, 12 feet in diameter and three feet thick, was discovered near the cathedral in Mexico City in the 18th century. At the center is the sun god Tonatiuh. Around Tonatiuh are the four other suns which met destruction as the gods Quetzalcoatl and Tezcatlipoca fought for control. After the destruction of a sun and the epoch it represents, the gods had to recreate the world and humans until finally the fifth sun held. At either side of the center, jaguar heads and paws hold hearts, representing earth. Fire serpents are at the bottom of the stone, as their bodies snake around the edge. The Sun Stone carving is probably the most recognized artwork of the Aztec world. The Aztecs created a rich variety of art works from massive stone sculptures to miniature, exquisitely carved gemstone insects. They made stylized hand crafted pottery, fine gold and silver jewelry and breathtaking feather work garments. The Aztecs were as intimately involved with art as they were with their religion and the two were tightly interwoven. 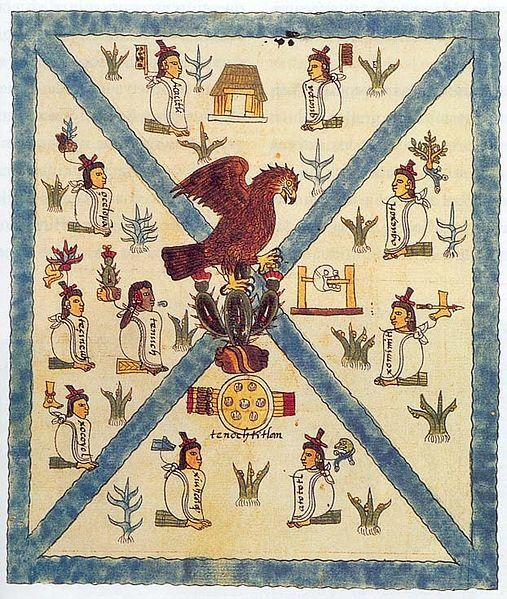 Our knowledge of the Aztec culture mostly comes from their pictogram codices and their art. Aztec craftsmen worked images of their gods into much of their artwork. In another article we’ll describe the great stone carvings: the Stone of Tizoc, the massive statue of Coatlicue and the Sun or Calendar Stone, as they are masterpieces of Aztec art. Of gold and silver jewelry, much of it was lost to the conquering Spanish who melted it down for currency. Feather works, unfortunately, don’t last for ages, although some samples remain. Textiles too, are destroyed by time, and pottery is fragile. Energetic stone carvings, however, remain to show us the great artistry of the Aztecs. While much of the Aztec population worked in agriculture to keep the empire fed and others were involved in the great trading networks, many others devoted themselves to producing the artworks that noble Aztecs loved. Thus, samples of artistic creativity in precious metal jewelry, decorated with jade, obsidian, turquoise, greenstone and coral still exist, mainly in smaller pieces such as earrings or labrets for lips. Pottery from Tenochtitlan and surrounding areas still reveal the fine abstract symbolism of the Aztecs. Feather workers made colorful tilmas for the emperor and nobles, and produced ceremonial costumes for the highest warrior castes, creating intricately decorated shields and headdresses. Many Aztec families and even villages were devoted to providing artwork for Aztec nobles. Every art had its own calpulli or guild. The nobles in the calpulli provided the raw materials and the artists created the finished works—the magnificent stone carvings, jewelry, elaborate ritual costumes for the great religious ceremonies and feather shirts, cloaks and headdresses. The Aztec emperors received art works as tribute or the artists sold them in the great marketplace at Tlatelolco. The walls of the great Tenochtitlan Templo Mayor are covered with carvings of Aztec symbolism. Stone carvers created sculptures of the Aztec gods to be used in the monthly religious ceremonies. Very common was the chacmool, a reclining figure which received the extracted hearts and blood of sacrificial victims. Aztecs in the rural regions carved the agricultural gods in both stone and wood, especially Xipe Totec, the god of spring and vegetation. Other carvers worked in miniature, creating tiny shells, insects and plants out of jade, pearl, onyx and obsidian. Artists created mosaic masks used in religious ceremonies with pieces of turquoise, shell and coral. These masks are highly representative of the Aztec devotion to their gods. Although much Aztec was destroyed during the Spanish conquest, many fine samples of each distinct art form remains to outline for viewers the great talent and technique of Aztec artists. Check the Aztec Resource Page on Aztec art for links to further information. Aztec symbols were a component of material culture in which the ancient society expressed understanding of the corporeal and immaterial world. The members of that culture absorb the symbols and their meanings as they grow up. They see the symbols all around them, on the walls of their temples, in jewelry, in weaving and in their language and religion. The Aztecs also used symbols to express perceptions and experiences of reality. The Aztecs, like the other Mesoamerican cultures surrounding them, loved symbols of their gods, animals and common items around them. Each day in the ritual 260-day calendar, for example, is represented by a number and a symbol. The tonalppohualli or sacred calendar, consists of two interlocking cycles, one of 13 days, represented by a number called a coefficient and one of 20 days represented by a day glyph or symbol. The day symbols include animals such as crocodiles, dogs or jaguars; abstract subjects such as death and motion; and natural things that the Aztecs saw around them every day like houses, reeds, water and rain. See the Ancient Scripts section on Aztecs to see good, colorful example of the day glyphs. All Mesoamerican cultures used body paint, especially warriors going into battle. Different ranks of warriors wore specific colors and used those same colors in painting their bodies. The most prestigious warrior society, the Shorn Ones, shaved their heads and painted half their head blue and half yellow. Other warriors striped their faces with black and other colors. Aztecs also decorated their bodies permanently in the form of piercing and tattoos, although there is not as much evidence for Aztec tattooing as for the cultures around them. The Aztecs centered their lives on their religion. For that reason, many statues and carvings exist of the Aztec gods, as hideous as they may be to modern eyes. Symbols of the sun, the eagle, the feathered serpent and cactus were used in the Aztec writing system, in dates and time and in titles and names. The magnificent Sun or Calendar Stone contains both the 365 day solar calendar and the sacred 260-day tonalpohualli, all of which are represented by the rich symbolism of the Aztec culture. Most Aztec symbols had layers of meaning. A butterfly symbol, for instance, represented transformation while frogs symbolized joy. When symbols were combined as in Aztec pictograms, entire stories could be told through the multiple layers of an Aztec symbol’s meaning. The day signs and coefficients corresponded to one of the Aztec gods, which means the 260-day calendar could be used for divination. An order of the Aztec priesthood were diviners. When a child was born, they were called to find a name for the baby based on the day of the birth and the god corresponding to that day. From these symbols, it was believed these priests could tell the baby’s fortune and fate. Today, because of the growing interest in body art, more people are learning about Aztec symbols and designs. To understand the Aztecs, it is necessary to understand, as best we can, their religious beliefs and how those beliefs manifested in their culture. To that end, we will look at their religion in general, the gods, sacred calendar and temples here. Other articles will cover religious ceremonies and rituals and the practice of human sacrifice. Aztecs were a devoutly religious people, to the extent that no Aztec made a decision about any aspect of his or her life without considering its religious significance. The timing of any event large or small required consulting the religious calendar. No child was named before a special priest, a diviner, could consider what name might best fit the child’s tonali or fate. Religion permeated every aspect of Aztec life, no matter what one’s station, from the highest born emperor to the lowliest slave. The Aztecs worshipped hundreds of deities and honored them all in a variety of rituals and ceremonies, some featuring human sacrifice. In the Aztec creation myths, all the gods had sacrificed themselves repeatedly to bring the world and humans into being. Thus, human sacrifice and blood offerings were necessary to pay the gods their due and to keep the natural world in balance. The Aztecs used two systems for counting time. The Xiuhpohualli was the natural solar 365-day calendar used to count the years; it followed the agricultural seasons. The year was separated into 18 months of 20 days each. The 5 extra days at the end of the year were set aside as a period of mourning and waiting. The second system was the ritual calendar, a 260-day cycle used for divination. Every 52 years the two calendars would align, giving occasion for the great New Fire Ceremony before a new cycle started. The Aztecs built temples at the top of sacred mountains as well as in the center of their cities. The temple we know most about is the Templo Mayor in the heart of what was Tenochtitlan, now Mexico City. At the top of this 197 foot tall pyramid stood two shrines, one to Tlaloc, the god of rain and one to Huitzilopochtli, the god of war. Templo Mayor was in the center of a great plaza, one of 75 or 80 buildings which constituted the religious center of the city. Sacrificial victims walked up the numerous steps to the top of the pyramid. After their hearts were extracted and given to the gods, their bodies were thrown down into the plaza. Human sacrifices Aztecs were a part of their religious ceremony that they believed properly appeased their gods to spare them from suffering. The numbers of people sacrificed by the Aztecs is a mystery today and will probably remain a mystery, unless more archeological evidence is uncovered. Whether only a few thousand of victims were sacrificed each year, or 250,000 as some scholars say, few human remains such as bones have been found at Templo Mayor or other Aztec temples. A couple of dozen skeletons and a few thousand loose bones and skulls do not add up to 250,000 or 20,000 or whatever number is cited. Evidence of human sacrifice comes from both the Aztecs themselves, their art and codices containing their writings, and from the Spanish conquerors. However, it is safe to say that the Spanish could easily have exaggerated the numbers killed to make the Aztecs seem more savage and brutal than they actually were. In 1487, the great Templo Mayor was dedicated in the main Aztec city of Tenochtitlan with a four-day celebration. How many were sacrificed during that time is a subject of scholarly speculation: some put the figure as low as 10,000 or 20,000, several others put it as high as 80,400 people sacrificed during those four days. Scholars think the Aztec priests used four sacrificial altars for the dedication ceremonies. However, if that’s the case and 80,400 people were killed, then the priests would have had to sacrifice 14 people every minute, which is a physical impossibility. Spanish missionaries sent to convert the Aztecs to Christianity learned the Nahuatl language spoken by the Aztecs. These priests and friars spoke to old Aztecs to learn their history. These Aztecs put the number of sacrificial victims at the time of the temple’s dedication at 4,000, a much lower total than 80,400. With scant archeological evidence, it is hard to know how many Aztecs died under the sacrificial knife. Many reputable scholars today put the number between 20,000 and 250,000 per year for the whole Aztec Empire. All Aztecs cities contained temples dedicated to their gods and all of them saw human sacrifices. Whatever the total was, we know from both the Aztecs and the Spanish that many human beings lost their lives to human sacrifice. We will probably never know exactly how many. The first thing to understand about the Mesoamerican cultures and the Aztecs’ use of human sacrifice is that they were not horrified by it. Instead, it was a natural part of life to them, necessary to keep the world balanced and going forward. Blood and sacrifice helped the sun to rise and move across the sky. Without it, their world would end. That’s not to say that all Aztecs and other Mesoamericans went to the sacrifice willingly. No doubt many did not want to be sacrificed or to die. Others, however, agreed to give of themselves for the greater good. When we picture victims being led to sacrifice, we see them as weeping, moaning and fighting to get free. For the most part, that simply didn’t happen. To die as a sacrifice was the most honorable death the Aztecs knew. When an Aztec warrior died in battle or an Aztec woman in childbirth, those were also good, honorable deaths. People who died as a sacrifice, as a warrior or in childbirth went to a paradise to be with the gods after death. In contrast, a person who died of disease went to the lowest level of the underworld, Mictlan. Many scholars have devised theories to explain this “darkness” of the Aztecs, their love of human sacrifice. Some posited that Aztecs were savages and amoral, less than human. Others have said the Aztec leaders used human sacrifice to terrorize their population and the nearby cultures. Some stated that an essential protein was missing from the Aztec diet and they needed the “meat” from human sacrifices to feed themselves, using cannibalism to do so. None of these theories, however, have held up. 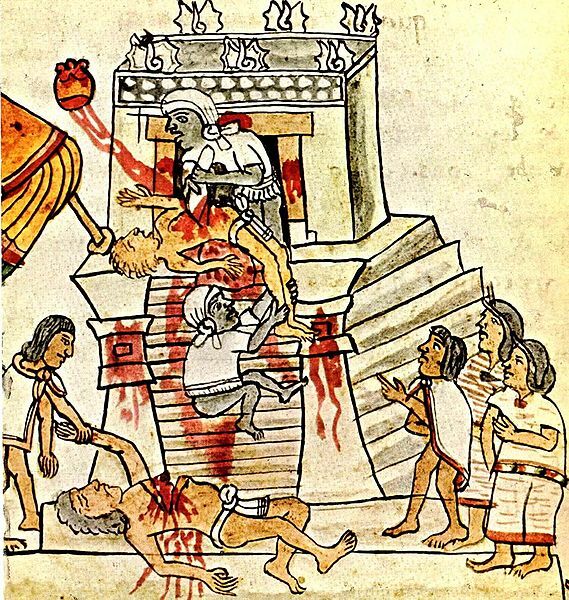 From its earliest inception, Mesoamerican cultures featured human sacrifice so it was plainly not “invented” by Aztec rulers to terrorize the people, nor was it a betrayal by the priesthood of Aztec spirituality. Studies of the Aztec’s mainly vegetarian diet flavored with occasional turkey or dog revealed all necessary ingredients to sustain life. The Aztecs had laws against murder and injury, just as we do, so it wasn’t that they were depraved savages. Rather, it was a central part of their religion and spirituality, to give up their blood and lives in devotion and dedication to the gods who had sacrificed themselves to create the world and keep it going. Most religions contain an element of sacrifice—giving up meat in Lent, for example—and giving your life for a friend is a great act of love. The Aztecs accepted this as a necessary part of life. By dying as a sacrifice, they honored the gods. Still, we can’t help but think that many didn’t wish to die, but accepted it as inevitable. After the Spanish Conquest, many Spanish priests and friars learned enough of the Aztec’s language to talk with Aztec survivors of the battles and diseases. From them, the Spanish learned that many of the sacrificial victims were friends of the Royal House, or high-ranking nobility and priests. Every class of Aztec occasionally were sacrificed, and all ages as well. Children were sacrificed to the god of rain. Often enough, however, it was nobles and captured warriors whose hearts fed the gods. Remember, however, that being sacrificed was most prestigious way to die. While this shocks us today, we must nevertheless give the Aztecs their due—they found human sacrifice not only acceptable, but necessary and honorable. The Aztec economy was based on three things: agricultural goods, tribute, and trade. Aztec trade was crucially important to the empire; there could be no empire without it as many goods used by the Aztecs were not produced locally. Prized white cotton could not grow at the altitude of the Valley of Mexico and had to be imported from conquered semi-tropical regions further south, as were cacao beans, from which chocolate is made. Two types of trading were important to the Aztecs: the local, regional markets where the goods that sustain daily life were traded and long-distance luxury trades. Each were vital to the empire, but served different purposes in the larger scheme of Aztec trade. Every Aztec city and village had its own market located near the city center. Tlatelolco, sister city to Tenochtitlan, had the grandest market, drawing 60,000 people to it daily. As with most regional markets, all kinds of utilitarian goods were sold, such as cloth, garden produce, food animals, obsidian knives and tools, medicines, wood, leather, furs and animal skins, precious metals, gems and pottery. If an Aztec housewife needed some tomatoes, bone needles and a headache remedy, she’d go to the market for them. While there, she could buy something to eat and drink if she had a cacao bean or two to trade. Many Aztec people went to the market not only to shop, but to socialize, another important aspect of the teeming regional markets. There Aztecs from every walk of life could meet and swap news and gossip. Pochteca were professional merchants, traveling long distances to obtain the luxury goods desired by the nobility: feathers from tropical birds, rare gems or jewelry and pottery created by other Mesoamerican cultures. The pochteca obtained anything rare and special, as well as the white cotton and cacao beans, earning them a special place in the Aztec society. They had their own capulli, laws and section of the city, even their own god, who watched over traders. They often had dual or even triple roles in the empire, besides being simple traders. They often communicated crucial information from one area of the empire to another. And some served as spies for the emperor, often going disguised as something other than trader. This last group, the naualoztomeca, traded in rare, easily carried goods such as gems, rare feathers or secrets. Some pochteca were the importers, others dealt in wholesale goods and others still were retailers. Agriculture, along with trade and tribute, formed the basis of the Aztec Empire. As such, growing enough food to feed the urban populations of the Aztec cities was of major importance. Many inhabitants of all of the Aztec cities were involved in planting, cultivating and harvesting the empire’s food. Three crops formed the staples of the Aztec diet: maize, or corn, beans and squash. Each of these three plants assists the others when they are grown together. For example, corn takes nitrogen from the soil, which beans then replace. Bean plants need firm support on which to grow; corn stalks provide that support. Luxurious squash leaves shade the soil, which keeps moisture in and keeps weeds out. These three plants are called the Three Sisters and planted together, provide a rich harvest of all three. Besides maize, beans and squash, the Aztecs farmed a host of other vegetables: tomatoes, avocados, chili peppers, limes, onions, amaranth, peanuts, sweet potatoes and jimacas. While most cacti grew wild, the Aztecs also cultivated those they found most useful, including the remarkable maguey cactus, also known as the Mexican aloe, which provided the Aztecs with paper, thatching for roofs, cloth, rope, needles, food from the roots of the plant, and a popular alcoholic beverage fermented from its sap. To grow all this food, the Aztecs used two main farming methods: the chinampas and terracing. Chinampas were essentially man-made islands, raised bed gardens on the surface of Lake Texcoco’s shallow waters. The Aztecs centered their empire in the Valley of Mexico, with its central basin leading up into the mountains surrounding the valley. To use the hilly land for farming, the Aztecs terraced the hills by cutting into them. 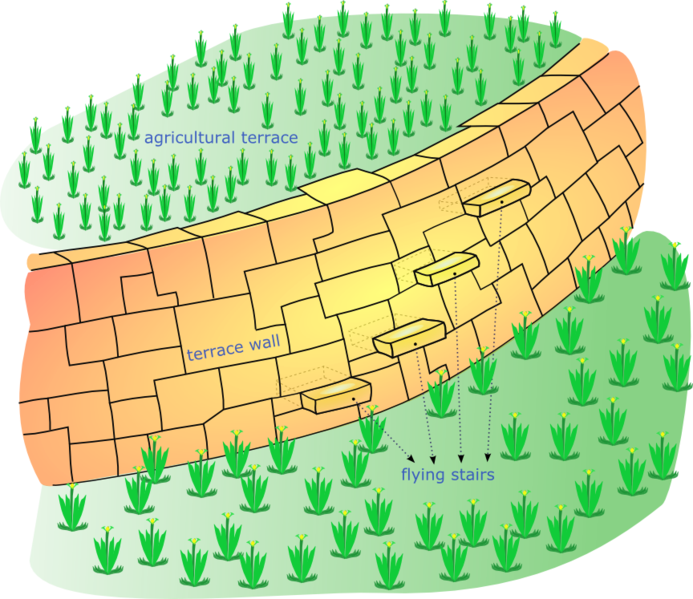 They then built a restraining wall to form a step in the hillside so that the land on the step can be used for crops. The chinampas farms were man-made plots of land built up from the sedimentation from the bottom of the lake. The Aztecs created large reed mats, which they floated in the shallows, the edges of which were built of woven twigs and branches attached to posts anchored in the lakebed. On the mats, they put soil from the lake bottom, rotting vegetation and dirt from nearby areas. Aztec farmers built up the soil until it was above the surface of the lake. They planted fast-growing willow trees at the corners of the plots to attach the chinampa to the bottom of the lake by the trees’ roots. At the height of the Aztec Empire, thousands of these fertile and productive chinampas surrounded Tenochtitlan and other Aztec cities. Terraced, irrigated fields added another layer of farmland for the hungry Aztecs. To bring water to these fields, Aztecs farmers dug irrigation canals in the soil. The terraces also grew the Aztecs major crops, providing an extra layer of protection for its vital agricultural production, on which the empire depended. Around the chinampas, the Aztecs could also catch fish, frogs, turtles and waterfowl such as ducks and geese. Lake Texcoco also produced one other favorite Aztec crop—algae from the lake, which we know today as spirulina. Aztec education was quite sophisticated compared to contemporary empires in the Eastern and Western Hemispheres. The Aztec Empire is one of the few older civilizations that featured mandatory education at home and in schools. Every child was educated, no matter his or her social status, whether noble, commoner or slave. Two different schools taught the young—one for the noble class and one for commoners, although bright, talented commoners might be chosen for advanced learning at the noble school. Children’s Aztec education, however, started at home with their parents. From age four or five, boys learned and worked with their fathers at a trade or craft, farming, hunting and fishing. Girls learned from their mothers all the tasks they would need in running a household. All children were taught a large collection of sayings called the huehuetlatolli, which incorporated Aztec ideas and teachings. The Aztec culture expected well-behaved people so children were taught to be humble, obedient and hardworking. The huehuetlatolli included many sayings on all aspects of life, from welcoming newborn infants to the family to what to say at the death of a relative. Every few years, the children were called to the temple and tested on how much they had learned of this inherited cultural knowledge. For the first 14 years of life, boys and girls were taught at home by their parents. After that, the boys attended either the noble school, called a calmecac, or the commoners’ school, the telpochcalli. Girls went to a separate school, where they learned household skills, religious rituals, singing and dancing or craftwork. Some talented girls were chosen to be midwives and received the full training of a healer. Other athletically talented girls might be sent to the house of dancing and singing for special training. Much of Aztec society was divided into calpullis, a group of interrelated families, somewhat like a neighborhood or clan. Each calpulli had its own schools, both calmecac and telpochcalli. Boys and girls attended the schools run by their calpulli. Calmecacs were schools for the sons of nobles, where they learned to be leaders, priests, scholars or teachers, healers or codex painters. They learned literacy, history, religious rituals, calendrics, geometry, songs and the military arts. These advanced studies in astronomy, theology and statesmen ship prepared the nobles’ sons for work in the government and temples. Telpochcalli taught boys history and religion, agricultural skills, military fighting techniques and a craft or trade, preparing them for a life as a farmer, metal worker, feather worker, potter or soldier. Athletically talented boys might then be sent on to the army for further military training. The other students would, after graduation, be sent back to their families to begin their working life. Aztec homes ranged from one-room huts to large, spacious palaces. As in their clothing and diet, the size and style of Aztec homes depended on the family’s social status. Wealthy nobles lived in many roomed elaborate houses, usually built around an inner courtyard. Poorer Aztecs and commoners usually lived in one-room homes, built of adobe brick and thatched roofs. Nobles could lavishly decorate their homes; as commoners were not allowed to do. Many Aztecs whitewashed their homes with lime so the houses would reflect light and stay cool. Many, or perhaps most Macehualtin or commoners were engaged in agriculture, taking care of the Tenochtitlan’s chinampas, or garden beds raised on the shallow shores of Lake Texcoco outside the city. They built simple, one room houses, usually with a few other smaller buildings and a garden in the lot. The family lived, slept, worked, ate and prayed in the big room, which had a small family shrine built in one wall. Most Aztec homes also had a separate building for a steam bath, as the Aztecs were very clean people. The kitchen area might also be in a smaller room built onto the house. Most simple Aztec homes were built of adobe bricks, which are made using mud, sand, water and straw, then dried in the sun. There were no windows generally, and one open door. Wood for door jambs and support beams could be found outside the cities. Furniture was also simple: comfortable reed mats for sleeping, wood or leather chests for storing clothes and low tables were in most homes, as well as clay pots and bowls, stone metates for grinding corn, a griddle, water jugs and buckets. Most work took place outside the home during the day. Men went off to tend the fields, taking the older boys with them. Women ground corn, cooked, spun yarn, wove cloth and watched the younger children, teaching their daughters what they would need to know when they married. Commoners’ homes were often built outside the city, nearer to the fields and chinampas where the men worked. Often, an interrelated group of families lived together in a unit called a calpulli. They would build their houses in a square with a common, central courtyard. The calpulli, which included both nobles and commoners, provided mutual aid for its members, functioning as a sort of clan. The nobles owned the arable land, which the commoners worked. The nobles provided the occupations, often craftwork, and the commoners paid tribute to the nobles. Nobles or pipiltin as they were known, lived in larger, finer homes often built of stone, although some were also built of adobe. Noble homes were often built around a central courtyard, where flower and vegetable gardens and a fountain would be found. These homes were often made of carved stone, and contained finer furniture than a commoner would have. Noble homes could have a peaked roof, or the roof could be flat and even terraced with a garden. As nobles were often involved in making laws and government, they tended to live nearer the city centers, around the central plaza and marketplace. At the top of society, the emperor lived in a luxurious palace, complete with botanical gardens and a zoo.